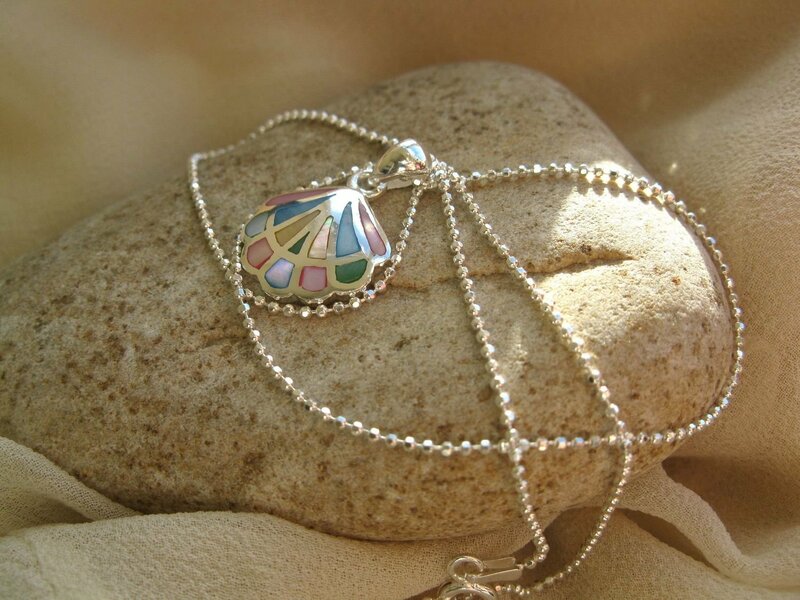 This is something rather special: Handmade in Galicia, northern Spain, this beautiful sterling-silver and pastel mother-of-pearl scallop-shell necklace would make a very special gift for a friend or loved-one as they travel through life and face its challenges. It is symbolic of El Camino de Santiago (the 1,000-year-old route to the great Cathedral of Santiago de Compostela) and, along with the addition of exquisitely-crafted mother-of-pearl, it makes a truly stunning piece of jewellery with meaning. 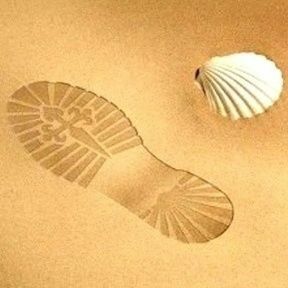 Some 200,000 people travel the Way of St James each year from all over the world, and many carry with them a scallop shell symbol like this. Wish your friends or loved-ones well by sending them this meaningful present. It would make a beautiful and unique gift to show someone that you really care. Dimensions: Shell measures 23mm in length including the hanging bail by 16mm in width and comes with an 18ins sterling silver diamond cut ball chain that sparkles in the light. 20ins length also available. Please choose in options box. The 1,000-year-old Way of St. James (El Camino de Santiago - in Spanish), criss-crosses Western Europe, arriving at Santiago de Compostela in Northern Spain on the Atlantic coast: Some people walk, others travel by bike. Many travellers choose to do the Camino for personal, rather than any spiritual or religious reasons - taking time out from their busy, modern lives and perhaps finding inspiration along the way, whilst reflecting on their lives in a supportive environment. Many carry with them a Scallop Shell charm. Everyone experiences the journey in a different way. Gift this beautiful scallop shell necklace to inspire your friends, and perhaps encourage them to be fortunate in their lives and safe on their journeys. Lovely Christening or Wedding gift too - Christmas and Birthday present as well. Comes gift-wrapped, like all our presents - and we can print a personal message on your behalf.